Christmas remains for the Brits and the French their favourite celebration. 'Réveillon' or Christmas Eve, however, is definitely something very French. Here is a brief guide to good addresses and ideas to enjoy Christmas Eve in style. At home or at the restaurant? Ah! Put your feet under the table, enjoy a delicious meal and avoid the extra time in the kitchen after a large meal. It is obvious that the restaurant option offers many advantages. Some places in London such as the Belvédère, Terrace or Gastro (addresses you can find on our website) are open on Christmas Eve. They offer the double luxury of relaxation and great food. The disadvantage however is the lack of intimacy that this special evening requires. Of course, nothing matches, should you choose this option, the warmth of an evening spent with your family at home, the delicious aromas coming from the slow cooking dishes mixed with the relaxing Christmas tree scents (as effective generally as Proust's delicious madeleines!). Fair enough, the host or hostess is unlikely to have much of a break. He or she can of course remind everyone that Christmas is first of all a family affair and that everything is shared including the dishes! This is the eternal dilemma, which translated into English is 'turkey or goose'? In France, the traditional turkey stuffed with chestnuts has progressively given way to more unusual menus using variations on poultry, game and seafood: fillet of hind with cranberries, quails with white raisins, ostrich steaks with vinegar, lobster in a cabbage basket, sautéed chicken and langoustines...To make the choice easier in this wide ranging selection, you can already proceed by process of elimination. You will find out for instance that capon (young castrated rooster) is not allowed to be sold in the UK and ostrich meat is relatively complicated to obtain at the moment (South African countries are not allowed to export their birds due to a flu epidemic). In addition, many butchers only sell this type of meat to order. An alternative to the Christmas Log? The tradition goes back to the time our ancestors used logs to heat their houses. The custom was that the guest invited to a Christmas Eve dinner brought a log from a fruit tree and they placed it at the centre of the fire on arrival. Central heating changed all that of course and now the custom has been adapted to modern times. These days, it is a cake in the shape of a log that people bring. If you are not absolutely attached to this tradition, have a look at 'La Maison du Chocolat'. They offer patisseries, ganaches and chocolate parfait. You also have the option of finishing your meal on an Italian note with a panettone from Flâneur or from the Bottega del Sole shop. Buy your smoked salmon from Forman's/Forman & Field, this company is the only smoke house in London. Established in 1905, 30a Marshgate Lane, London, E15 2NH. Foie Gras is found at Cornucopia, Unit 22h Wincombe Business Park, Shaftesbury, Dorset or Francetoyourdoor.com. 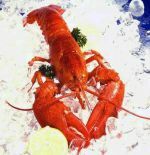 Canadian Lobsters can be purchased from Picard frozen food at extremely good value for money (£3.42/250g on special offer) See Picard Catalogue on our website. Meat and game can be bought from Chadwick's (organic butcher), 208, Balham High Road SW12 ou WM Vicars & Son, 20 West Street, Reading, Berkshire (Supplier to Chez Bruce restaurant). Poultry (pheasant, quails, poussins, duck, corn fed chicken...) can be bought from Keenl and Keenl at Smithfield Market before 8.30am. Pascal Aussignac from Club Gascon (one star in the Michelin) shops there. 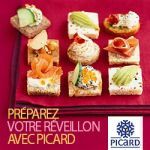 some of the best Christmas logs on the market can be found in the Picard catalogue. Chocolate delicacies galore from Maison du Chocolat, 45-46 Piccadily W1, Panettone at Bottega del Sole, 323 Fulham Road, or at Flâneur's 41, Farringdon Road, EC1. Francetoyourdoor.com: Champagne Picard Grande Réserve (£13.50) or a 1998 vintage champagne such as the Picard Art de Vigne (£25.95). Marks & Spencer: Cote de Brouilly 2003 (£8.99), Château de Surville 2001 Costières de Nîmes (£6.99). Sainsbury : Sainsbury's Classic Selection Cabernet Sauvaignon/ Merlot 2003 Western Australia (£6.99), Château Clément Pichon Haut-Médoc (£14.99). Very nice Bordeaux : Château Magdelaine 1989 St Emilion (£40-£50), Château Léoville Barton 1988 St Julien (£47). Chez Bruce: Rabbit Terrine with saffron, thyme and parmesan plaice, mousse of coquille St-Jacques with a vermouth and prawn sauce. Chez Club Gascon: Carpaccio of duck, cream of cauliflower and sea urchin, capon country style, chestnuts purée and foie gras.